By the time you're reading this, the new Twilight menu (no, not the ones featuring glittery vampires) from McDonald's Singapore might have already stopped as I understood that it is a limited edition run, but I wanted to share a review of the two special burgers I tried when they came to our shores in selected stores (mostly around outskirts of town), which I tried on Tuesday evening! We started with the Grand Twilight Burger which is a big mac configuration with two patties and an extra middle bun. Instead of lettuce and tomatoes, this has steak sauce on the patty, onions and a tamago! The steak sauce was what's intriguing - it didn't taste too salty or artificial. Instead it was slightly smokey and bitter and rather light on actual taste. It went well with the indulgent egg which is also the same one used in the current Beef/Chicken Tamago burgers. The Classic Twilight was the preferred burger of the two though. It was made with the Quarter Pounder patty, with lettuce, tomato, slivered onions, nacho cheese sauce and two pieces of turkey bacon added, just in case you are very hungry. It's dinner after all! The serving is definitely huge. I liked the crunch of the veggies, mixed with the generous layer of nacho cheese sauce that held all the ingredients together. It was really satisfying! I suppose you can do a Special Order now in stores for dinner by adding lettuce and tomatoes to your Quarter Pounder Burger! Lastly we topped it off with dessert! We had the Sunset Dream - apple pie with butterscotch sauce drizzled on them and soft serve vanilla, which was pretty average and something you can make on your own any time you like. 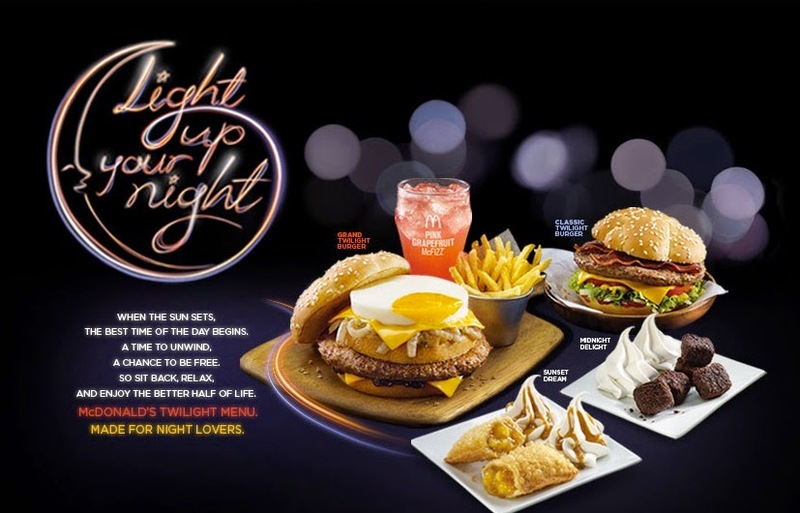 I really had fun trying the new Twilight menu from McDonalds Singapore! I hope you've enjoyed reading about this, and do keep your eyes peeled next time something new comes in!